I could pretend to have something momentous, thoughtful, or even vaguely coherent to say, but what I really want to do is get in my pajamas and then in bed. If I'm lucky, I'll even do it in that order. 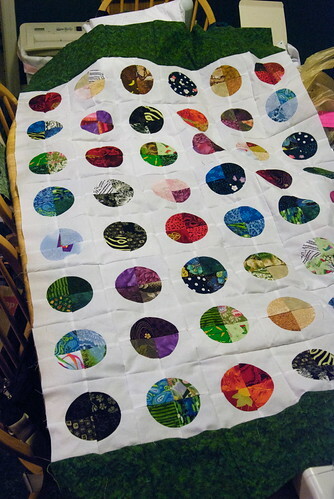 Tomorrow night I'll finish putting the green striping around the blinkenlights, then sew the 6" squares into a border. 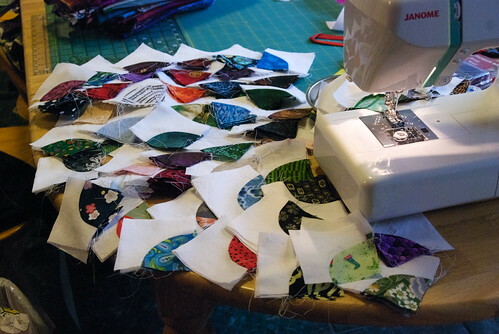 Attach those, iron the backing, gather up my Longarm Quilting Crap™ and then fall over ded, as a certain esmerel says. Saturday morning I will get up, pull on comfy clothes, make a vat of chai, and go to the quilt shop, hoping that round two of battling the longarm quilter will be less stressful and more successful than the first round. I LOVE Blinkenlights. Wish I had the ambition to tackle one of those. 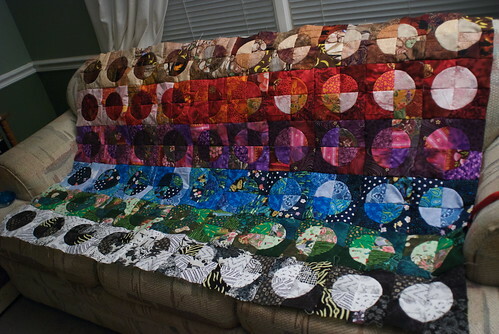 It's one of those quilts that makes me happy to look at it.